Make 2013 the year you discovered your green thumb. Judging by the huge tree roots that take over the sidewalks of some New Orleans streets, it looks like it would be easy to get something to grow in the Crescent City. But there’s more to planting a garden than putting a seed in the ground and watering it a few times. We talked to local experts to put together this step-by-step guide to help you grow a beautiful garden. Once you’ve settled on a location, you need to test your soil. Take a soil sample to a local garden center, or send the sample to the Louisiana State University AgCenter, where it will be analyzed in a lab then sent back to you within seven to 10 days with a report about the state of your soil. You can pick up a box to send your soil to the LSU AgCenter at local garden stores or at the Orleans Parish extension office in room BW15 in City Hall (1300 Perdido St., 658-2900). For more information on the process, visit LSUAgCenter.com. Another thing to check before you start planting is drainage. 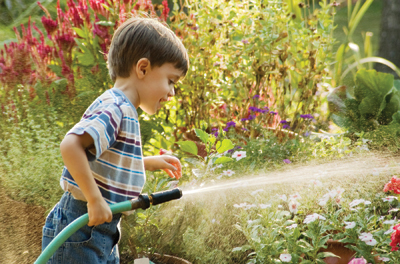 New Orleans is known for retaining water, so it’s important to make sure your garden isn’t doing the same thing. “Drainage is key because plants like oxygen,” says Andrew Loyd, the Orleans Parish Assistant Cooperative Extension Agent for the LSU AgCenter. “If there’s water sitting there, the roots aren’t going to grow and with the anaerobic conditions, they’ll die.” To make sure your garden is going to drain, add more soil to make a mound – “essentially a raised bed,” Loyd says – so the water will drain off. Survey your sun situation. Before you run out to the garden store, you also have to observe the amount of sun your future garden gets. Take some time to examine the amount of sunlight. Look at the spot in the morning, in the middle of the day and in the evening. Whether the spot gets a lot of sun or sits in the shade will determine the types of plants you should buy. And not knowing what kind of sun your plants are going to get could ruin your garden – not to mention your mood. Be realistic with yourself. You will have to commit some time to watering. Lydia Pollard, a member of the board of Master Gardeners of Greater New Orleans, and the manager of the ARC Project’s Uptown greenhouse, says it’s important for gardeners to keep checking their plants and to use their best judgment when it comes to watering. “You can’t water on a schedule because it depends on if it has rained,” Pollard says. She recommends sticking a finger deep into the soil to examine the moisture. Decide what you want. Once you know you have good soil and drainage, and you have an idea of the sun on your garden, you’re ready for the plant store. Make a plan for what you want your garden to look like. What colors do you want? What kinds of plants do you want? Remember that a plant is only going to do well if you buy it for the right amount of sun. Make sure you’re looking at plants for your sun situation, and then choose the ones you want. For color, Loyd suggests grouping certain colors together. This is when you can get creative and think of colors that work well together or the colors that you want to look at every day. As far as specific plants, angelonias are a popular warm-season plant, says Melinda Taylor, a horticulturalist and color expert at the New Orleans Botanical Garden. Torenias, cat’s whiskers, gomphrenas and ornamental sweet potato are also good options, as well as marigolds and vincas.